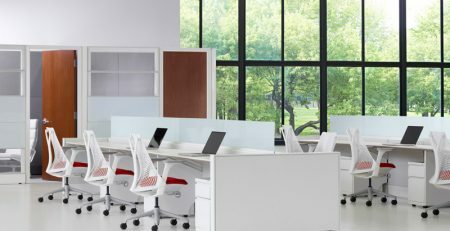 What Are the Parts of a Herman Miller Ethospace Cubicle? Have you ever heard of a cantilever, direct connect base-feed or a draw rod? Odds are you haven’t. They are only a few of the many components found in a Herman Miller Ethospace cubicle. Ethospace office cubicles are made up of over 20 different parts and pieces, which might explain why a professional installer is almost always required to install them. 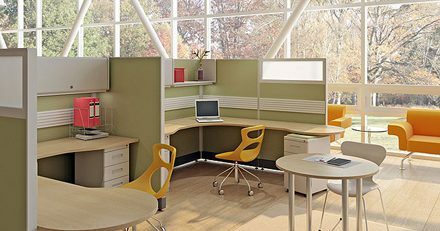 The following guide will aim to teach you the ins and outs of the Herman Miller Ethospace Office Cubicle. Acoustic tile – Tiles that help dull noise in the cubicle. Beltline power – Power access that is above the worksurface. Bullnose edge – Worksurface with a rounded edge. Bullpen – Cubicles are configured to allow multiple occupants with a centralized area of collaboration. Cable management – The ability to organize electrical and data wires. Cantilever – Shaped like a right triangle and under the worksurface, the cantilever is used to support the worksurface. Change of height finished end – A trim piece used to finish adjacent frames of different heights. 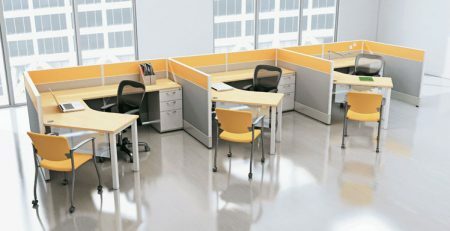 Cluster – A group of cubicles that share a center spine. Com ports – Additional knockouts to provide access to data. Connector – To connect 2,3, or 4 frames at a 90, 120, or 135 degree angles. Contour edge – A worksurface with a gradually curving edge. D top – A worksurface that has a semi-circle shaped worksurface. Used in teaming environments. Direct connect basefeed – Connects the building’s power to the cubicle’s power. Basefeed enters through the wall or the floor. Draw rod – Connects a frame to another frame. Edge style – The style of the worksurface’s edge. Edgeband – Finishing material of the edge of a worksurface. End panel – The sidepiece of a shelf or a flipper door unit. Finished end – Trim piece used on the end of a frame. Flipper – An overhead storage unit that has a front, door-like, panel that can be locked. Frame – The underlying steel structure of the cubicle. Essentially it is the core of the cubicle. Jumper – Piece of electric that connects the baseline power to the beltline power. Keyed alike – When all storage components of a cubicle use the same key for access. Knockouts – Plastic pieces used to cover unused data or power access. Laminate tile – A tile that is covered with a laminate. Marker tile – A tile that serves as a whiteboard. P top – A worksurface that is shaped like the letter P.
Pass through harness – A piece of electric used to connect one powered frame to another, without outlets. Post leg – A leg used to support a freestanding surface when a cantilever cannot be used. Power pole/ceiling entry – Connects the building’s power to the cubicle’s power. Basefeed enters through the ceiling. Raceway – A trim piece used at the bottom of the frame. Can be powered or not powered. Rail tile – A tile allows the addition of paper management accessories. 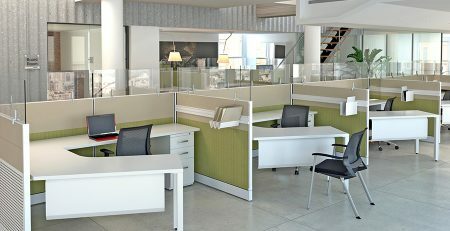 Spine – The shared centralized frame used in a cluster of cubicles. Square edge – A worksurface with a square edge. Stacker – Extension added to frame to increase the height. Support panel – Panel used at the end of a workstation when no wing panel is present. Tackable tile – A tile that can be thumbtacked. Tile – Rectangular pieces that clip onto the frame of the cubicle. Also known as the skin of the cubicle. Tile elevation – The order in which tiles are placed on the frame. Top cap – The trim piece for used on the top of the frame or connector. Trough – A plastic piece of the back of a worksurface where wiring run and organized. Upmount glass – Glass that is mounted on the top of a frame. Wing panel – The frame and tiles that help enclose the workstation, located at the end of the worksurface. Worksurface – The surface of your cubicle in which your computer and other items are placed. 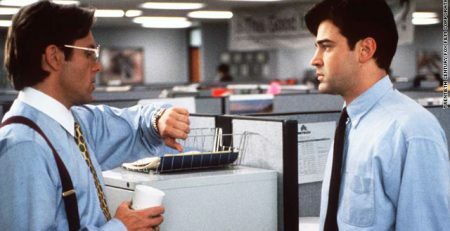 What Are the Top Office Cubicle Brands? Can Office Cubicles Replace Your Meeting Rooms? 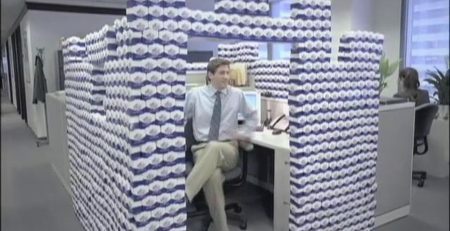 Have You Seen the Cubicle Castle?